"Incredible live performances are bound together with delightfully-produced audio visual footage of the original artistes in an all-new production that is both moving and powerful. Telling the story of two high school chums who went on to record truly iconic songs which proved to be the soundtrack to the Sixties: including Mrs Robinson, The Sound of Silence, The Boxer, Homeward Bound, Cecilia, Feelin' Groovy and Bridge Over Troubled Water. Introducing original movie footage and intriguing filmed interviews with Paul Simon and Art Garfunkel. 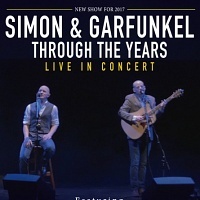 Featuring touching narration taken from the Victoria Kingston book "Simon and Garfunkel - The Definitive Biography". Starring the duo's incredible songbook, featuring a succession of million sellers. Accompanied by a superbly-talented string quartet. Written and performed by Bookends, who deliver Paul and Art's delicate harmonies in deliciously authentic style."